Impact House v Lisabon, Portugalsko: Zarezervujte nyní! mpact House has the capacity to accommodate up to 41 conscious travelers who want to visit Lisbon in a different way. With both dormitories and private rooms, any traveler can choose to have a more responsible stay in Portugal. Located in a typical Lisbon neighborhood, Estrela, Impact House is just 20 minutes away from the downtown. You can find local shops, traditional restaurants, the stunning Estrela garden, supermarkets, ATMs and most utilities you will need just around the corner. 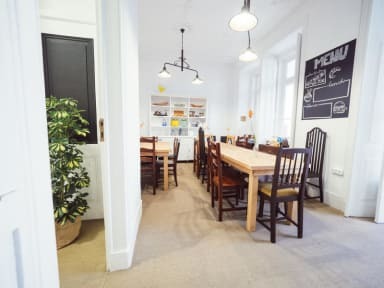 The Hostel is surrounded by several connecting options to the city center, such as the historical 28-Tram (20 minutes away from the center), buses (20 minutes away from the center), and the Alcântara train station that leads you to Lisbon or Cascais (25 walking distance from the hostel). The airport is just 8,2 kms away. But what is really unique about us is our sustainability concept. We developed innovative projects based on circular economy and in partnership with local non-profit partners. These projects are integrated in the very basis of the way the hostel works. Some examples are the compensation of 100% of its CO2 emissions; the upcycling and wooden waste usage as furniture of the room; the social and sustainable shop; the ecologic and biodegradable cleaning projects; the art gallery for disabled and changemaker artists; the vertical garden; the buying in bulk policy or the almost closed food and waste cycles.